A practical vehicle for all reasons with good looks is the new Peugeot Rifter which has just gone on sale from £19,650 for the five seater models available now, and £21,570 for the seven seat versions available early 2019. The ‘boxy’ styled Rifter is available in two lengths, Standard with five seats and next year the Long version with seven seats. The interior comes with high independent seating positions, low load height, two front hinged doors, two sliding rear side doors and a huge high opening tailgate with an independently opening rear tailgate window. The platform is a mix of PSA Group’s EMP2 modular platform at the front, as used by the Peugeot 3008, 5008 and new 508, and the RG5 rear end platform as used for commercial vehicles which maximises load space without intrusion from suspension components. The Peugeot Rifter also has equally new siblings in this sector under the PSA Group of brands, namely the Citroen Berlingo and Vauxhall Combo Life but specifications and styling vary as do the prices. 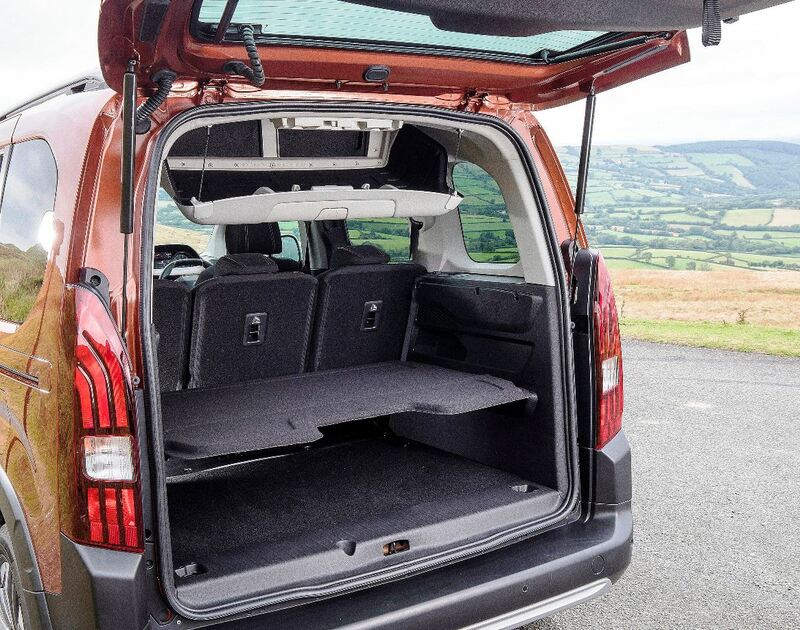 The Rifter has 28 easy access storage areas and a ceiling mounted clever aircraft style overhead locker which can be accessed from the rear load area or from the second row of seats. With the Standard 4.40m length model with the five independent seats in use there is 775-litres of load space under the parcel shelf and up to 4,000-litres under the ceiling in the 4.75m Long version with the second row of seats folded down and the third row seats removed. For good measure the load area parcel shelf has two different height settings and it can be stowed away behind the back of the second row of seats. The front passenger seat can also be folded down into the floor to enable the carrying of long objects. A ‘bag-in-the-roof’ type front passenger airbag allows for a high capacity upper glovebox. The Rifter uses Peugeot’s i-Cockpit front interior design with its compact steering wheel, an 8.0-inch centrally mounted dashboard colour touchscreen and head up binnacle display. 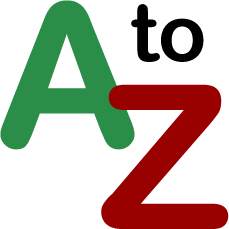 There are Active, Allure and GT Line specification levels. The 1.2-litre petrol engine choices are PureTech 100hp with a 6-speed manual gearbox or the 130hp with the new 8-speed automatic gearbox is due early next year. The 1.5-litre BlueHDi turbodiesel offerings are 75hp manual, 100hp manual and 130hp manual or 8-speed auto. For those users needing a shade more traction for more adventurous use off-road or during winter weather Advanced Grip Control is a £650 option and this includes 16-inch grippier treaded tyres and Hill Descent Control. 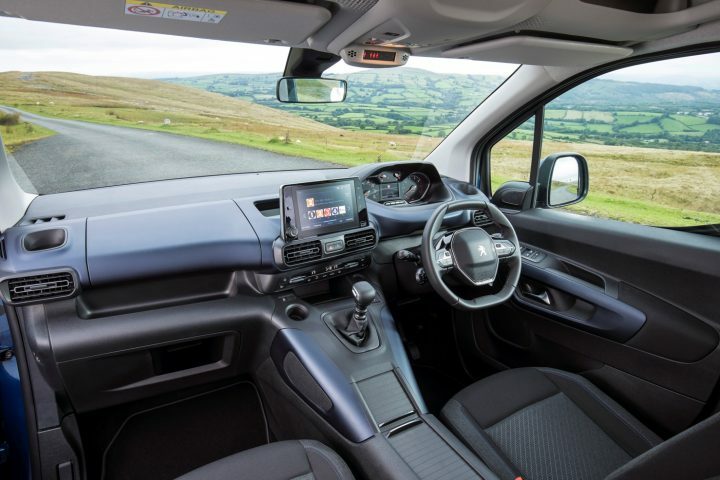 Just as impressive as the interior design is, just as important is the exterior styling which makes this MPV less like a van with windows, but more like the current trend of SUV styling. 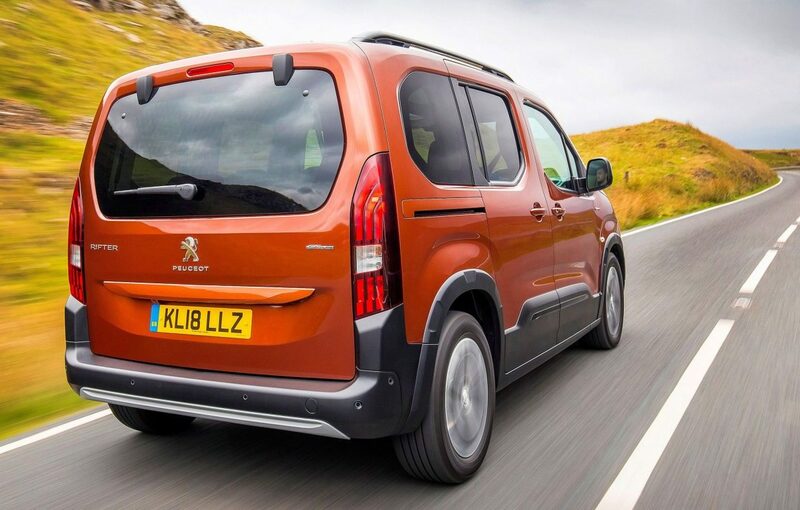 Peugeot term it as a leisure activity vehicle for ‘Daily Explorers’, active, informed and family focussed but equally it is a very practical vehicle suited to the Motability sector with its clever adaptability. 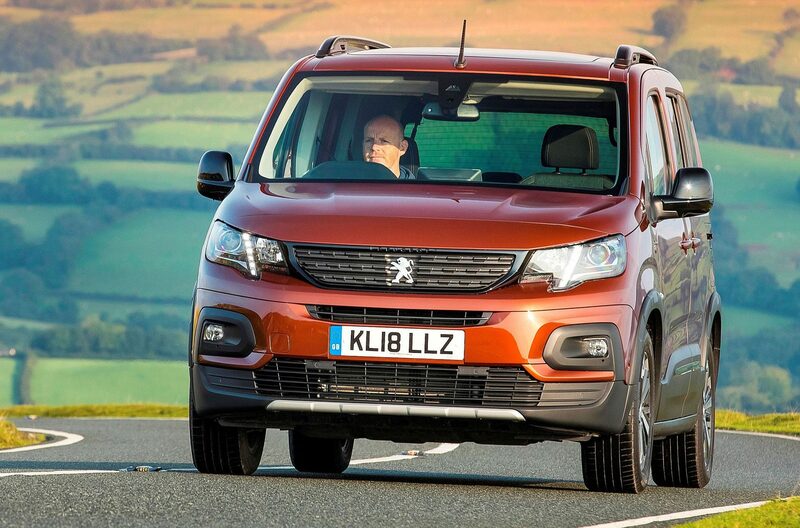 The exterior design has a high level bonnet with its traditional latest Peugeot front face and vertical grille with a relatively high stance on the road and cube shaped rear end from the rear side sliding doors backwards. Maxime Bailly, Peugeot UK’s Rifter product manager said they expect to sell around 4,000 units next year with 60% of customers choosing the five door version, 56% will chose a diesel engine and fleet/business sales will be around 63% with Motability accounting for 46% of that figure. As far as trim and equipment level choices go 70% are expected to be for the mid level Allure, 20% for the GT Line and 10% for the starter Active level. The SUV look is enhanced with large doorsill protective panels, wheel-arch extensions and front and rear scuff plates for the short front and rear overhangs. Every model comes with roof bars enhancing its activity style. So it looks good, it’s very smart and it is totally practical if load or people carrying are the major requirements. The equipment levels are good as well. All versions include spec items such as a full set of front and side airbags, auto door locking when starting off, Lane Keeping Assist, Speed Limit Recognition, Active Safety Braking, electric and heated door mirrors, multifunction computer, electric front windows, Bluetooth, DAB radio, front fog lights with cornering function, automatic lights and wipers and 16-inch steel wheels. The best selling Allure spec additions include electric parking brake, rear parking sensors, electric rear windows, 8.0-inch touchscreen with Mirror Link including Apple CarPlay and Android Auto connectivity, voice recognition for the radio, navigation and telephone, halogen headlights and 16-inch alloy wheels. The top spec GT Line additions include automatic dual zone climate control, Open and Go keyless entry and push button start, power folding door mirrors, tailgate opening window, panoramic glass sunroof with blind, connected 3D navigation with TomTom live, Peugeot Connect SOS and assistance and 17-inch alloy wheels plus various GT badging. At the media launch Peugeot had GT Line Standard five seat top spec models available to showcase the range. My test car was powered by their new 1.5-litre 130 (129HP) BlueHDi turbocharged direct injection diesel engine matched with a 6-speed manual gearbox. This package weighed in at a cost of £24,220, close to the top end of the five door model’s price list. With 300Nm of torque this engine is strong at high speed cruising speeds, responsive in the mid range and very flexible and easy to drive at low speeds or in stop and start traffic. Like all engine options this unit has Stop&Start as standard. Top speed is 116mph so 70mph cruising, even when loaded, will be easy and the acceleration is not shabby either given its motoring role in life. The new WLTP procedure in operation for all new cars sold from 1 September is 65.7mpg and on my short test drive around winding country roads last week the real-life figure was 51.3mpg, not close to the official figure but acceptable enough and it will improve for longer runs. The ride comfort was very good, very comfortable and compliant but being a tall-bodied vehicle there was the to be expected body-roll during higher cornering speeds but not enough to upset passengers or dislodge whatever items are being transported in the cavernous load area. 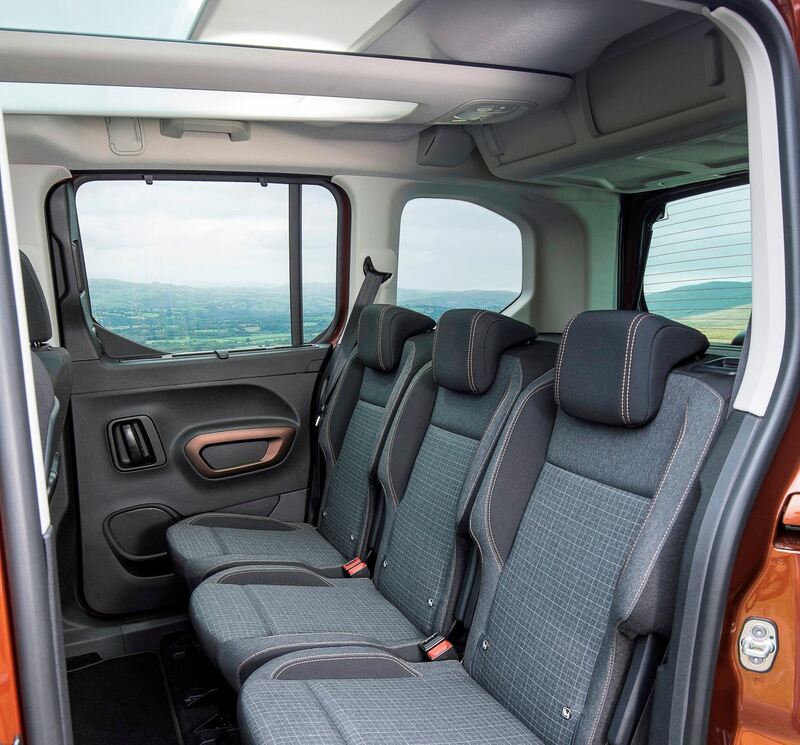 Access was really very easy with the high seating positions ideally suited for those passengers feeling less agile and it allows for easy loading of children into their child-seats. Visibility was good all around. It’s a thoroughly practical good looking MPV with an SUV styling twist and with very clever interior seating and load carrying options. 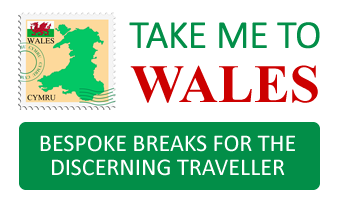 It’s not going to be everybody’s next must-have fashionable vehicle, it is what it is, the best way to carry people or business goods in a sensibly sized vehicle at a realistic price and no doubt will appeal to the Motability and taxi/private hire market sector as well as active younger recreational focussed users with or without offspring. Against: Some mild cornering body roll, real-life fuel economy didn’t match the new WLTP figure, some main functions still need to be operated via the touchscreen, some hard plastic interior trim, ungenerous warranty.